Recently, I tackled the thorny topic of native plant cultivars. Native plant enthusiasts have a broad spectrum of opinions about these versions of native plants, selected and bred to suit the needs and/or desires of gardeners. In that post, I talked about some of the ways that these native plants may suit people but fail to suit the needs of our wildlife. American chestnut, Some rights reserved by Jami Dwyer. Beatriz highlighted an important aspect of native cultivars: they are not always designed to benefit humans exclusively. Through the rampant, and sometimes careless, transport of exotic plants from one continent to another gardeners have occasionally introduced pests which devastated once-important populations of native trees. As detailed in the fabulous book American Chestnut: The Life, Death, and Rebirth of a Perfect Tree , chestnut blight was one of the first well-documented cases of this in the United States: William Murrill noticed a pathogenic fungus from Asia began killing American Chestnut (Castanea dentata) in New York in 1904, and by the 1940s this once important species had been virtually extirpated from its natural range. There are isolated stands of American Chestnut which had been planted by settlers, which have so far been spared infection by the most virulent strains of the blight. And researchers are working hard to develop blight-resistant cultivars of Castanea dentata, either by identifying naturally resistant trees or by hybridizing American Chestnut with Chinese chestnut trees. These cultivars, if successfully developed, will play a crucial role in reintroducing this important species to our forests. 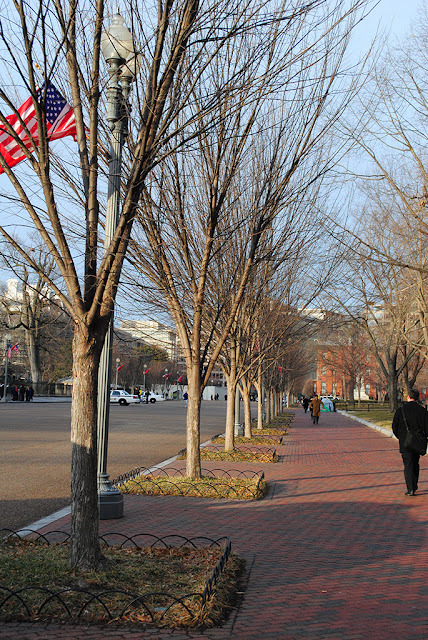 Princenton Elms planted near the White House, in Washington D.C. Image courtesy Casey Trees. In the meantime, I encourage people to plant the straight species anyway. Although virtually all of these non-resistant trees will eventually succumb to blight, they do not tend to die completely. Rather, the blight causes them to die back to the ground and then re-sprout. These trees never gain the beautiful form of the unaffected trees, but they still provide some of the wildlife value they are meant to provide. In some ways, the iconic American Elm is an even more hopeful case. This stately tree, once severely threatened by the imported Dutch Elm Disease (DED), is most certainly on the rebound in cultivated landscapes. There are several DED-resistant cultivars available today. The Princeton Elm is one of the best known and most widely sold American elm varieties. This cultivar was originally selected for its beautiful vase-shaped form, and was subsequently observed to be DED-resistant. As a result, it is becoming much more commonly used as a street tree just as the American Elm had been before the 1960s. The Valley Forge Elm is another widely available variety of DED-resistant American Elm. Most reports suggest the Valley Forge is even more resistant than Princeton, but it tends to require more attention to pruning and training when young than the Princeton. Other cultivars of American Elm are being trialed, and I generally advise the use of multiple cultivars in landscapes where genetic diversity is aesthetically acceptable. I’ve just barely scratched the surface of these “beneficial” cultivars, but I want to point out three more things. One is that both the American Chestnut and American Elms are cherished not only by people, but also by wildlife. The chestnuts are an important source of protein for wild animals, and both species are important larval host plants supporting hundreds of species of butterflies and moths. In some cases, they are unique hosts so including these species in native plantings within their native range is critical even if they don’t have perfect survivability. And the selective use of disease-resistant cultivars can allow us to include these species in managed landscapes. The second is that in both cases, landscape specimens of these native trees played a crucial role in the survival of the species. It DOES matter what we plant along our streets, in our parks, and at our homes. Creating metapopulations of rare and/or endangered plants is important, but it is also important for us to maintain a stocks of native plants in places where we can observe them closely: you never know when the next imported pest will threaten a cherished native species and by keeping these species close to us, where we can monitor their performance, we can maximize the chances of saving them should it happen. And the third is that it DOES matter that we maintain a genetically diverse gene pool of native plants. Different plants react differently to pathogenic threats, so it is important that we not overplant any single species and especially important that we not overplant any single cultivar of a species. There are many native plants that, for all intents and purposes, exist in the horticultural trade as a single widely planted cultivar. Viburnum dentatum ‘Blue Muffin’, Rudbeckia fulgida ‘Goldsturm’, Panicum virgatum ‘Shenandoah’, Crataegus viridis ‘Winter King’, Physocarpus opulifolius ‘Diablo’, and so on. Seeking out and planting straight species or, at least, a variety of cultivars seems like wise insurance.